1) What are the standard photo and frame sizes? We measure picture frame sizes in terms of the photo size that fits into the frame. So the “size” of the picture frame refers to its inner dimensions. It’s outer dimensions are greater. For example, if a 4x6 inch frame has a 2-inch wide moulding, the outside dimensions of the frame are 6-by-8 inches. The most common frame sizes for personal photos have traditionally been 4x6, 5x7, and 8x10, which look great in most environments. Recently our 5x5 picture frames have become popular for Instagram frames and photos. Their square size means that your Instagrams don’t get cropped, and the relatively smaller size means that low-resolution Instagram photos look good in their printed form. 2)What size print will make my digital image look good? Have you ever printed an image that you thought looked great on your device, only to receive a blurry or pixelated print? The issue here is photo resolution. “Photo resolution” refers to how many of your photo’s pixels fit inside each inch of paper when printed. The more pixels you have per inch of printed area, the sharper the resulting print is going to look. Photos taken with most modern smartphones at their default quality will look great if you choose an 8x10 frame or smaller. Unfortunately, many photos received via SMS or messenger app are not suitable for printing as these apps tend to compress the image files and reduce their resolution. It’s generally best if you use the original image, which can be transferred via email (when emailing image files, make sure that the sender chooses to send the image at full resolution). If you are uploading your photos from Instagram, they are low resolution files. Instagram saves your images at a resolution of 640x640, and used to save images at 612x612 (so your older Instagrams will be at this resolution). But these do still look good in our 5x5 frames. However, they will look even better if you upload the original photo from your mobile device. Frameology allows you to upload images directly from your phone, making framing these photos just as easy as posting to Instagram in the first place. Alternatively, you can just upload photos to our frames directly from Instagram. If you upload your photos from Facebook, they can actually be a quite high resolution. It depends. Facebook used to save all photos at a low resolution, but now photos can be saved up to a width of 2048 pixels wide. What does this mean for framing? Older photos will be at a low resolution and suitable for our smaller frames (4x6 or 5x5). Photos taken in the past 5 years, however, may look great in frames up to 8x10 assuming you uploaded a high resolution file to Facebook in the first place. Regardless of how you upload your image to Frameology, we will guide you through the process and suggest frames that are an appropriate size given the resolution of your digital image. 3) Which size frames will look good? • It’s hard to see the details of everyone’s faces in group pictures unless you print them in a large enough size. We recommend 8x10 picture frames or larger for group shots. 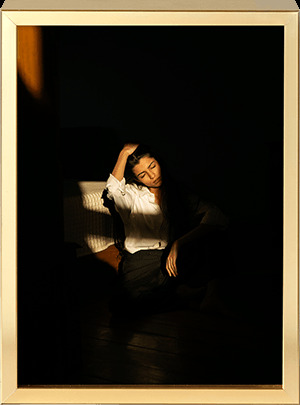 • The intimacy of small moments, such as in a close up shot, can be enhanced by reflecting this sentiment with the size of the frame - a 4x6 or 5x5 picture frames could be a nice, delicate choice here. • If you display a group of framed photos together, choose size based on importance. Your favorite wedding shot? You probably want to go with an 8x10 picture frames. A fun but less substantial moment? Choose 4x6 or 5x7 picture frames. • Did you have professional photos taken? For an engagement or graduation, for example? Larger frames, like 8x10 and 11x14 picture frames, tend to show off professional photos best. For additional points, silver frames or gold frames will reflect the importance of the occasion. Over our decades of experience with our brick and mortar store, we have found that most of our customers prefer to display the largest format frames with mattes in them. Mattes add an additional display element that complements the photo contained within. For this reason, Frameology’s 11x14 frames contain a 8x10 print with an acid-free, museum-quality matte. Ultimately, if your photo file is large enough, choosing the right sized frame boils down to preference. But if in doubt, the above tips are sure to steer you in the right direction.